Now, I am not suggesting that we as leaders in financial services all run out and go "Full Ballmer" at our next sales meetings. 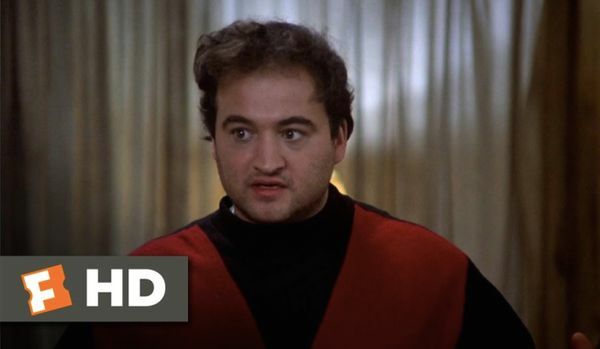 And, I am not suggesting that we go "Full Bluto" and reenact John Belushi's iconic speech from the 1978 National Lampoon's movie Animal House (I won't include a link as it is an R rated movie clip). I am, however, suggesting that we, as an industry, need to spend a little less time reading from spreadsheets on a PowerPoint screen and a little more time getting people engaged, inspired, motivated, amped up and ready to run through walls for us and the company. Of all the leadership styles we have studied this is the big problem for the finance industry. We too often assume that people should be self motivated or that they should be motivated by financial rewards and incentives. This outdated mindset could be the reason we are seeing more and more recent graduates bypass our industry for a more meaningful existence with companies like Google. Emotion: noun – A natural instinctive state of mind deriving from one’s circumstances, mood, relationships, interactions and experiences with others. Two of the most current and hotly debated topics in the fields of behavioral psychology, organizational development, and corporate training, are the issues of emotional intelligence, and leadership-skill development. Emotional Intelligence describes a person’s ability or capacity to identify, assess, and manage and their own emotions and the emotions of others. The fifth leadership style, Emotional Leadership, deals specifically with a leader’s ability to engage, inspire, energize, and/or motivate the members of their team. To put it another way, the Emotional Leader brings the energy, inspiration, motivation, and mental strength to a team. Inspiring and motivating others to perform at their highest levels. Helping others to envision themselves achieving their fullest potential. Determining what is important to their team members and connecting their work to those issues. Helping team members to see themselves at their best, most-effective state. Rallying team members around a universal cause and creating a sense of importance around their mission. Creating a sense of pride and a sense of unity around the organization and each other. Coaching and mentoring the members of their team. Leading by example whenever possible and showing people how to get it done. They keep people up when times are tough. They challenge us to be our best and to be better than we think we can be. Our first four leaders in this series – the Ethos Leader, the Knowledge Leader, the Vision Leader, and the Operational Leader – all complement the Emotional Leader very well. On behalf of these first four leaders, the Emotional Leader will often act as a spokesperson with the team, their clients and in the community. The Emotional Leader is expert at helping others to understand their values and what they stand for. The Emotional Leader understands where people need training and knowledge, and they are typically superior teachers, coaches, and mentors. The Emotional Leader has a unique ability to communicate and create buy-in around a vision for the future. The Emotional Leader takes detailed strategy and makes it seem simple and compelling for all in the organization. The Emotional Leader is a master communicator due to their focus on and ability to create compelling and inspiring messages. All that the first four leaders build, the Emotional Leader promotes, evangelizes, and creates support for. Of course, the ideal is to have a leader, or group of leaders, who possess all five of these skills (or better yet, all seven), but we will discuss this later in this series. The Emotional Leader is a communicator and a motivator who works well independently, one-on-one, or in large group settings. Emotional Leaders tend to be very focused on the people they are trying to influence, and they do their best to genuinely understand everyone’s personality type, engagement points, goals, personal history and hot buttons. Their goal is to help their people to become the best they possibly can be and to help them perform at their highest levels. This type of leader judges their success based on the number of people they help motivate, inspire, energize and help to self-actualize. They are builders of people and they seek to help people define themselves and discover meaning in their work and in their life. They are, in short, passionate about people. When they are thinking strategically, these leaders work hard to develop plans that will inspire the members of their team to succeed and enjoy what they are doing while becoming loyal to the organization, and to them personally as the leader. For example, when the Emotional Leader is thinking strategically about clients, they tend to think about ways to captivate and engage the client on a personal level, how to make their life easier, how to solve their problems, and how to keep them loyal for life. They are almost always driven and motivated by their need to deliver a valuable and memorable experience for all of their constituents. These leaders tend to be very empathetic and sympathetic and they are likely to feel any failure on a very personal and emotional level. As a result, they tend to address damage control situations with a very direct and “hands on” approach. One of the dangers for the Emotional Leader is the potential for high-energy overkill and/or the potential to merely be seen as the stereotypical "over the top" locker room salesperson. It is very important for the Emotional Leader to avoid being pigeonholed as too much of a "rah-rah" person, and to provide real, sincere substance behind their messages and outer demeanor. These leaders should make careful determinations about when to inspire through high-energy communications and when to inspire through more determined, thoughtful, measured and direct messaging. As mentioned, the Emotional Leader is usually the key communicator and voice for the team and must provide a spark for their team members. In some instances, a situation calls for high energy; yet in others it calls for brief, direct, confident, and straightforward communication. The Emotional Leader’s approach is not focused on any one style; rather they are focused on what it takes to get through and make an emotional impact with the person or people they are dealing with. The Emotional Leader is laser focused on understanding people, their needs, concerns, fears, worries, and aspirations. These types of leaders have the ability to identify and tap into human emotions and they make considerations for all that is important to the people who are important to them. The Emotional Leader then helps them achieve their goals, and overcome their fears. They convince their followers that they can be better than they ever imagined they could be, and then they show them how to make it happen. Historical Example of the Emotional Leader – Martin Luther King Jr. Philosophy: It is incredibly important to engage, inspire, energize and motivate the people on the team. People are our competitive advantage. Emotional inspiration comes from achieving a sense, of hope, importance, self-actualization, and high personal achievement. Mistakes to Avoid: Assuming that team members are totally self-motivated and do not want to be inspired to perform at a higher level. Not realizing that people want to be part of something bigger than just their day-to-day work. Best Practices: Making sure you have a clear message and the ability to understand the needs, wants, desires, hopes, and dreams of your constituents and then inspiring them to perform at their highest level. Helping people to feel a sense of pride in their work, their company and communicating how it will help them to achieve higher level of self-actualization. Creating effective incentives, rewards and celebrations around winning and trying. What inspires my team to perform at their best? What is important to my team and team members and how do I make that happen? What incentive programs do we provide that excite our people? When was the last time I delivered a motivational speech or one-to-one conversation? To what degree to we help our people create a personal vision for their own success? Why would somebody stay with our team forever? What do our people say about our company and/or me when with friends/family? What companies have the best employee engagement levels and why? What do my competitors do that leads my best employees away? What do I need to do to inspire my leaders to be more inspirational?